Our story begins in the early 1920s with an inventive scientist named Samuel Ruben and an eager manufacturer of tungsten filament wire named Philip Rogers Mallory. Ruben came to the P.R. Mallory Company seeking a piece of equipment he needed for an experiment. But Ruben and Mallory saw an opportunity: Uniting Ruben’s inventive genius with Mallory’s manufacturing muscle. Their partnership, which would last until Mallory's death in 1975, was the bedrock of Duracell International. The company’s first alkaline batteries are marketed under the Mallory brand name. These new generation batteries are specifically designed for and supplied to Kodak to help feed its energy hungry Instamatic camera with built-in flash. In 1965, Duracell brand name is introduced along with a push for consumer-driven programs and products. Batteries are directly supplied to Agfa, Kodak and Polaroid, producers of a new generation of portable consumer devices such as tape recorders and walkie-talkies. In 1969, Duracell is part of the Apollo 11 mission and becomes the first battery on the moon. In 1971, Duracell introduces its iconic copper & black colors which symbolize the conductivity, strength and superiority of its battery formula. Duracell batteries are the first batteries to advertise on TV, and quickly become part of everyday household vernacular, with the catchy advertising slogan: “No other battery looks like it. 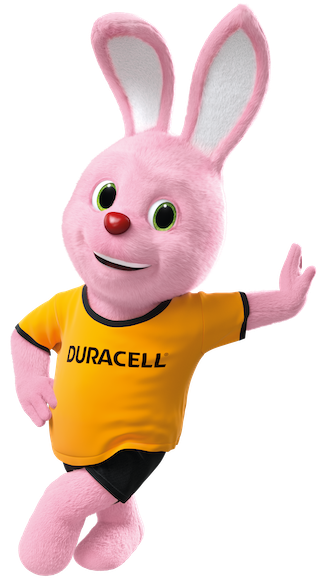 No other battery lasts like it.” In 1973, Birth of the Duracell Bunny. New York advertising agency Dancer, Fitzgerald and Sample create the memorable ‘Drumming Bunny’ TV advertisement. 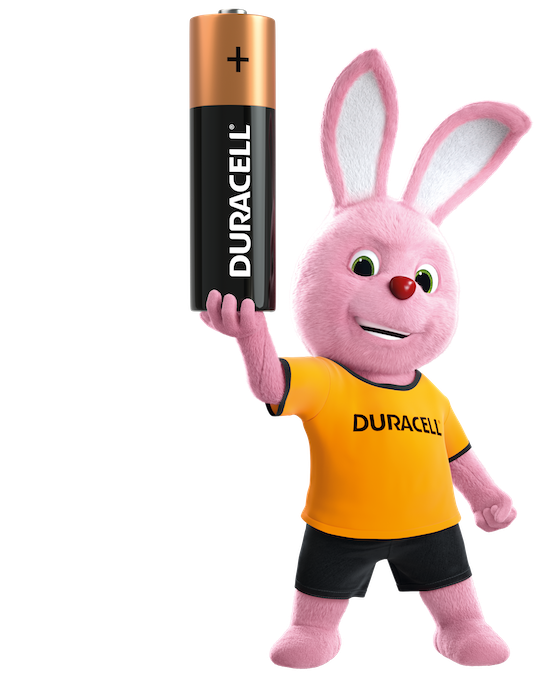 Ever since, the bunny has epitomized Duracell’s superior battery longevity compared to ordinary zinc carbon batteries. Over the years, the Bunny character has evolved from a simple toy into a playful and well-loved brand icon who adds warmth and personality to the Duracell brand. On average 63 Duracell products are sold every second around the world and more and more devices are being launched that require battery power. In the minds of consumers, the Duracell Bunny and the ‘Copper Top’ labelling are synonymous with batteries and we aim to build on this strength by responding to new areas of demand. Our ambition is to be the first choice when it comes to powering devices that are most relevant to consumers, and create long-term value and success for our partners. Duracell has a rich history of innovation through continuously developing batteries that are more compact, more powerful, more efficient, and longer lasting than competitor brands. Since the 1940s when the roots of the original company were founded, Duracell has been responsible for many industry firsts, including the first alkaline AA and AAA batteries and the first hearing aid cell button. Duracell batteries were even first to land on the moon and powered the first Logitech wireless mouse making computer work much more convenient. Duracell’s quest to innovate continues today with products like Duracell Ultra Power, which is our best and most powerful alkaline battery across all devices. Significant investment in R&D ensures that Duracell products remain the most trusted for everything from the latest high performance smart toy and video game consoles, to portable power technologies rapidly charging smartphones. Duracell’s unique “POWERCHECK™” allows consumers to instantly verify a Duracell battery’s power level to be given a second life in another device with lower energy needs. This creates value for our consumers and helps to reduce waste. For decades now, Duracell superior alkaline batteries are free of any heavy metal. Duracell is the number one battery brand recommended by the world’s largest device manufacturers because of superior, long-lasting performance and high quality product experience for consumers. There are many reasons to work for Duracell, the world’s number one consumer battery company! As the leading manufacturer of high performance alkaline batteries we believe in supporting growth and rewarding excellence, so join Duracell and help us continually deliver reliable power!